If you like learning, laughing, and meeting amazingly strong women, you should come to Woman Up! In conjunction with Portland Monthly’s Oregon Woman feature, Portland Monthly magazine is hosting our second annual Woman Up! event, where ladies from across this great state will teach each other, eat together, and talk a whole lot! On Saturday, May 12, treat yourself to learn from some of Oregon’s most fierce females. These are women who lift, ride, cook, and write. They zen out, and they amp it up. They are just like you and they want to share! Woman Up! is a weekend to celebrate women. Let’s lift each other as we climb! Saturday is Woman Up!’s Day of Wellness. Brought to you by Cambia Health Solutions, this will be a holistic day with workshops from Barre3, MegaBurn, Point Gym and Kitchen, Pause Meditation, and many more. We start the day off with the most important meal of the day, brought to you by Elephants Delicatessen, Imperfect Produce, and Sip Juice Cart; and then launch into a full schedule of workshops, panel discussions with remarkable wellness entrepreneurs, and discussions on how to make your dreams become a reality. We are honored to have Justice Adrienne Nelson, Oregon’s first black female Supreme Court justice, and Peggy Maguire, Senior Vice President, Corporate Accountability and Performance at Cambia Health Solutions, as our keynote speakers. After lunch, we will continue into workshops ranging from Kiki Littlestar’s Live Advice Column, to getting your hands dirty with illustration, sun print, and ceramic pinch pot sessions. The afternoon will end with the second most important meal of the day, happy hour. Here we will sip on local wines at Jason Mendell of Cascade Sotheby’s Wine Walk, and honor women who have paved the way. We welcome teens, mothers, daughters, and allies to embark on this day of empowerment. Saturday’s Day of Wellness is 13+. Learn more and see the full lineup at our Woman Up! website. Woman Up! day two will be a Mother’s Day like no other. Walk, stroll, roll, or march in our Mother’s Day Races. Cross the finish line and step right into the Woman Up! Festival and afterparty! At this female-focused festival, you can enjoy a musical lineup curated by Fabi Reyna of She Shreds magazine, food trucks and bites from Imperfect Produce, Artemis Foods, from La Pomme de Portland author Carrie Minns, and Elephants Delicatessen. Wash it all down with Truly Spiked & Sparkling or a glass of local wine. Peruse the Woman Up! pop-up shops including Dipped PDX, Athleta, Womens Healthcare Associates, LPGA Golf, and Strides Against Breast Cancer to name a few. Plus, you can win an amazing Headlands Coastal Lodge and Spa giveaway or buy a raffle ticket and support Girls Inc.
To continue empowering the next generation of Oregon women, a portion of the event proceeds will be donated to Girls Inc., the organization inspiring all girls to be strong, smart, and bold. 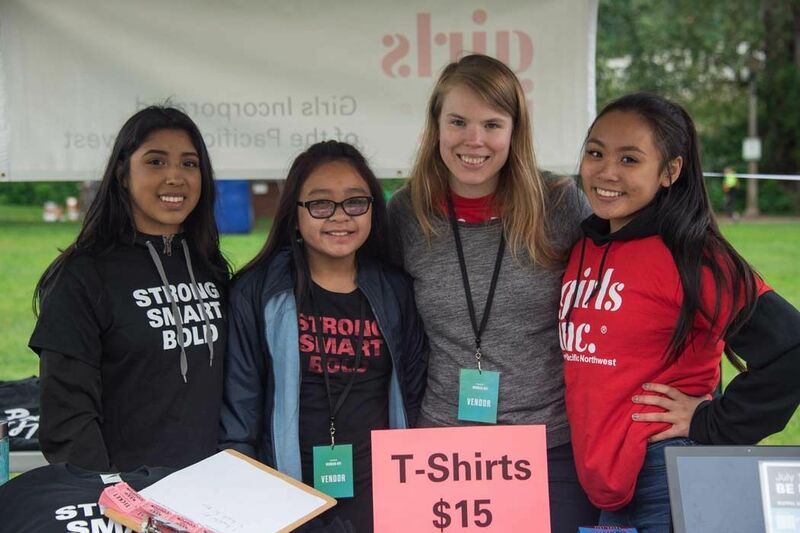 Girls Inc. provides life-changing afterschool programs and experiences that help girls ages 6-18 grow up to be healthy, educated, and independent. Tickets for the full weekend are available now at womanup.pdxmonthly.com.